Louisiana black bear; photo © Louisiana artist Guy Fanguy (all rights reserved; used by permission). The Louisiana black bear was designated the official state mammal of Louisiana in 1992. 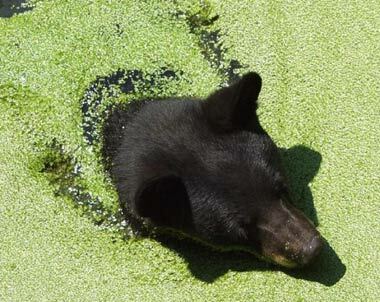 The US Fish and Wildlife Service listed the Louisiana black bear as threatened in 1992. Once common, biologists estimate the current population to be only 3-400 animals. There are 16 recognized subspecies of black bears in North America - black bears living in Louisiana, lower Mississippi, and eastern Texas are designated Ursus americanus luteolus (the Louisiana black bear). Louisiana black bears are black, some with a white "blaze" on the chest (American black bears in other regions can also be chocolate or cinnamon brown, even rarely white or pale blue). Adult males weigh from 250 to over 400 pounds, with body length up to 6 feet. Males may range over 100 square miles seeking food, refuge, den sites, and mates. Females are smaller and range much less. Louisiana black bears survive mostly on berries and acorns - they are not active predators. Bears are very intelligent, shy and secretive animals; actually seeing a bear in the wild is a very rare experience. Black bears (Ursus americanus) have strong, highly curved claws and the face profile is convex compared to the more concave profile of a brown bear. The black bear is an official state symbol in three states: New Mexico, West Virginia, and Louisiana.